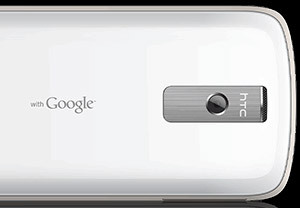 The second Google Android platform-based smartphone, the HTC Magic is known worldwide as G2 device and will be available exclusively through Vodafone and offered to their customers in the UK, Spain, Germany and France. Salivating Android users keen to get their mitts on this keyboard-less beastie will have to hold their breath a bit longer – Vodafone is remaining coy about the exact launch date for the device and there’s ne’er been a peep about pricing either. Although there’s a lot to like about the Android OS and the slimline looks of the G2 are a pleasure to behold, early previews have indicated that the software keyboard is a bit of a fiddly fella to type on. The specs aren’t to be sniffed at though, with the handset packing a trackball, capacitive 3.2-inch touchscreen (320 x 480 pixel resolution), 528MHz Qualcomm MSM7201a processor and 192MB of memory. Almost all of the connectivity boxes are ticked too, with support for 900MHz and 2100MHz HSDPA 3G networks (offering up to 7.2Mb/s download and 2Mb/s upload speeds), GSM/GPRS/Edge bands, Bluetooth 2.0+EDR, 802.11b/g Wi-Fi connectivity, Infrared, built-in GPS navigation capabilities. After the less than fantastic response to Vodafone’s Blackberry Storm, the company are keen to offer viable alternatives to the all-conquering iPhone, which remains exclusive to rival firm O2. I’m a bit tempted by this phone. I love my iPhone but Android’s approach sits better with my politics. Dethone Herr Jobs and gimme open source! 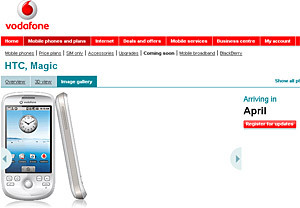 I have just revceived the new HTC Magic (G2) on a trial basis – I wanted an i-phone from Vodafone but it’s not available until January. So I was hoping that this phone would be a suitable substitute. Cosmetically it is very nice, and seems robust. However, having spent a few days with it now using all the usual every day apps, and trying some new ones, I am unfortunately extremely disappointed. Having used an i-phone 3Gs temporarily in the recent past too, I am able to make a comparison, and the i-phone wins for me. Not by alot but enough. For example, smart phones seem to have a generic messaging system whereby they are not grouped into folders as in most previous generation phones i.e. inbox, sent, drafts. Instead it simply ‘tags’ all texts in a continous document style on the screen, only in order of sender and displays them in ‘chat/conversation’ format. It’s difficult to tell what was sent and what was received, this is true of all smart-phones note- inc I-phones(I see it as a bad glitch in their op systems) It’s not good for speedy texters. The on screen keyboard is also extremely difficult to use. I have very narrow fingers and even I found it very hard to get the right character on each attempt. Its very frustrating – as if you were typing with boxing gloves onand makes typing a simple text very, very laborious, and more painful than Bruse Forsyths jokes.. When entering the text on a browser page for example there is no backwards arrow to reposition your cursor and the small keyboard makes this worse than frustrating as you have to ‘swipe’ your finger and try to aim for the right part of the screen. Most disappointing of all is the fact that iplayer is not compatible with this mobile, you can get to bbc websites bit the appropriate Flash plug-in is not downloadable. The camcorder has no zoom in or zoom out or editing functions at all. It simply records exactly what is coming through the lens, and that`s it. It also seems impossible to navigate round the menu to then delete anything you have recorded. I could go on but it seems unfair. I recommend this phone for those who want a very capable phone for playing some games and messing around on the internet now and again, but not for someone who will rely on it for professional communications and fast, easy use.